World Animal Protection has delivered a comprehensive assessment of each country and considers a number of indicators which address the key issues relevant to improving animal welfare around the world. Read the full detailed methodology below which outlines the themes included, individual indicators and scoring system applied. This first publication of the Animal Protection Index (API) provides ratings for 50 countries. These countries were selected using statistics published by the Food and Agriculture Organisation of the United Nations in their Statistical Yearbook for World and Agriculture 2012, from the countries which are the largest producers of beef, poultry, pork, sheep and goat, milk and eggs. Whether the legislation or policy includes a structure of relevant enforcement mechanisms. Although this does not assess the extent to which enforcement activity has taken place in the country, it shows whether the legislation or policy has the potential to be effective. Countries are scored within seven bands, both for individual indicators and on an overall basis. These bands are A through to G, A representing the highest scoring and G the most room for improvement. Scientific research confirms that all vertebrates are sentient, and indicates sentience in some invertebrates. Sentience means the capacity to have feelings, including pain and pleasure, and implies a level of conscious awareness. Recognition of animal sentience is an important step in the protection of animals and is fundamental to ensuring that animals’ welfare needs are met. The API also examines whether the government supports the Universal Declaration on Animal Welfare (UDAW). The UDAW is a proposed formal international acknowledgment of a set of principles giving animal welfare due recognition among governments and the international community. To date, 46 country governments are fully supportive of the UDAW as are ministries from 17 other countries. The Council of the European Union has encouraged European Union Member States and the European Commission to support the UDAW, and the United Nations Food and Agriculture Organisation has recognised that the UDAW provides a valuable guiding philosophy for efforts to improve the welfare of animals. The World Organisation for Animal Health (OIE) passed a resolution on 24 May 2007, backing the development of a UDAW in principle. Specific policy and legislation is then considered in relation to certain aspects of human interaction with animals. Prohibition against causing suffering to animals is a common starting point for legislation protecting animals. The API examines whether there is legislation prohibiting such conduct, including by deliberate acts of cruelty and by failure to act. Different categories of animals and animal use are then considered, to assess whether there is protection for each particular group. It is important that governments recognise animal protection as an independent issue and allocate responsibility for improvement at a high government level. This enables animal welfare issues both to be addressed as independent concerns and to be taken into consideration in other areas of policy-making such as the environment and trade. The World Organisation for Animal Health (OIE) is an international organisation concerned with the protection of animal health and welfare, with 178 member states and territories worldwide. Government engagement with the OIE can therefore assist in improving animal welfare. The OIE also provides a tool for the assessment of veterinary services in the country, on issues including disease control, food safety and animal welfare. 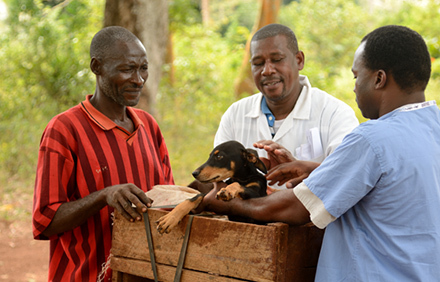 Governments can request assessment by the OIE’s Performance of Veterinary Services (PVS) tool and can choose whether the resulting report is made publicly available. The API considers the extent of engagement with the OIE and scope for this relationship to lead to improvements in animal welfare. The work of the OIE and its standards in the area of animal welfare are recognised internationally as providing a model for good animal protection. The standards are developed through the work of expert groups, and since 2005 the World Assembly of OIE Delegates has adopted twelve animal welfare standards on issues such as transport and slaughter of animals. The API examines whether these standards and the OIE’s guiding principles on animal welfare have been incorporated into domestic legislation. The API also examines whether the government publishes reports on progress towards goals set to monitor and improve animal welfare. This allows for public accountability, raises public awareness of animal protection issues, and provides strategic direction for relevant government bodies. Existing mechanisms to capture, analyse and publish data relevant to animal welfare promotion or improvement. Inclusion of humane education in the national education system is an important way of effecting change by instilling principles of good animal care and protection within society at a young age. This goal also comments on the inclusion of animal welfare issues within veterinary medical courses and relevant government public education and training initiatives. Government consultation and engagement with relevant stakeholders, including NGOs, is an important step in the delivery of the necessary attitudinal changes to deliver improvements in animal welfare. Policies, laws and standards should be developed in consultation with a broad range of key interest groups to ensure that they are fit for purpose and enforceable.